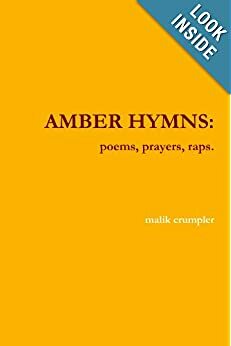 “Malik Crumpler’s Amber Hymns is a difficult collection to describe: sprawling through an urban chaos in which music and language combine, it is a bold attempt to codify a human experience where reality and spirituality exist both within and outside the mind. The work flows through many states, with Crumpler informing us that ‘Fire informs the chaos | that will permit | your new form to form’. The self is purged and a renewal is enacted: the motif of the phoenix and the owl – symbolic of resurrection and of death – abound the text.” –EGOIST REVIEW, Cambridge U.K.
Verse of April Celebrates Its 5th Anniversary 2019, Paris Lit Up Tour Dairy 2019, Paris Lit Up UK TOUR chapbook 2019, Divine Frankensteins The Sunday Tribune: Seeking Truth 2019, A Feel of the In-Between: An Interview With Juice Aleem The Opiate 2019, Visual Verse: An Anthology of Art and Words 2018, About That Vibe (Leon Bridges Interview) At Large Magazine 2018, JONATHAN FINLAYSON’S SONIC GALLERIES Itchy Silk (part 1), JONATHAN FINLAYSON’S SONIC GALLERIES (part 2), Cold Lips Online 2018, Beyond Being Woke part one Itchy Silk 2018, Beyond Being Woke part two Itchy Silk 2018, Uncloakin’ Beneath The Underground Across The Margin 2018, Tin Lunchbox Review Vol. 2 No. 1 2018, PARIS IS A SHIP: Wifty Fun Press 2018, Maintenant 12 2018, COLD LIPS 04 2018, Fjords Review 4.3 2018 (Pushcart Prize Nomination), The Bioptic Review 2018, GANGSTER RAP-HEGEMONY CIRCA 1980 2018, GANGSTER RAP-HEGEMONY CIRCA 1980 (part 2) 2018, GANGSTER RAP-HEGEMONY CIRCA 1980 (part 3) 2018, Quiet Lunch No. 5 (2017 Pushcart Prize Nomination), The Mild Party 2017, Not My President 2017, States Of The Union 2017, POSTVOTE (an addendum to POSTmortem) 2017, Emergency Index vol. 6 2017, PLURAL:Online Prose Journal 2017 , BLYNKT ISSUE 2 2017, Verse Of April 2017, Bottlecap Press 2017, Rise Up Review 2017, maintenant 11 2017, Quail Bell Magazine 2017, FIVE: 2: ONE 2017, [ PANK ] 12 2017, The Elephant Magazine 2017, MULTIRACIAL MEDIA 2017, POSTmortem 2017, THE RUMPUS 2017, REJECTED POETRY JOURNAL 2017,DATABLEEDZINE 2016, TSUNAMI GANG 2016, “Intercapillary Space” 2016, The Opiate Online 2016, The Bastille 2016, to kingdom come voices against political violence 2016, The Gambler Mag 2016, Midhell NYC -2016, Paris Lit Up Magazine n°3 2015, GAMBAZine 2015, VisceralBrooklyn 2015, Brooklyn Paramount 2015, B’AM 2014, Apogee Journal 2014, The Opiate Summer Vol. 1 & Vol. 6 2014-2016, Art Fuse 2013, thosethatthis 2013, NYC MIND 2012, PROSPEKT PHOTO 2012, NYC Columbia University Rwanda Relief 2006, Madmens Calling 2005, Cipactli- 2004, Cuba Libre -2001, S.F. Punk Hop 2001, The Unseen Magazine -2000, Aware Magazine 1999 . Malik Crumpler also wrote several musicals, monologues, ballets/ arias commissioned by Harvest Works NYC, Gilles Peterson BBC 6 London, UK World Wide Radio London, UK Arat Kilo Festival ENRACINEMENT / DÉRACINEMENT – DÉPLACEMENT (3e édition) Orléans, France, Arat Kilo Festival Jazz sous les pommiers Normandie, France, L’Openbach Ecocentric Festival Paris, France Composers Now NYC, Firehouse Space Brooklyn NY, Dixon Place NYC, Liberation Dance Theater NYC, Association of Performing Arts Professionals NYC, Native Tongue Brooklyn Actors Fund Theater, Rush Arts Galleries NYC, Love Yourself Project NYC, Panoply Lab Brooklyn NY, B’AM Paris, France B’AM Vancouver, Canada On-Point Brussels, Belgium MayWay Records Kortrijk, Belgium Black Beacon Sound Sheffield, UK & Double Wei Factory, Hong Kong, China.